Free download Super Dodge Ball game for PC. It is a sports based arcade game developed for neo geo platform. Super Dodge Ball game can be played on PC by downloading from this website. 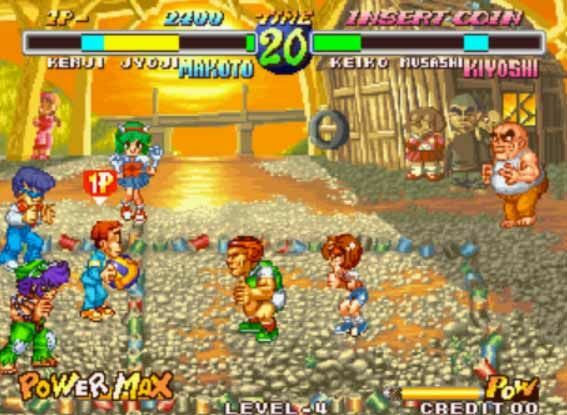 Super Dodge Ball game was developed by Technos Japan Corporation and published by SNK. Super Dodge Ball PC game is very easy to download and play. There is no need to install this game on your computer. Download the zip folder from the download link given below. After downloading, extract the folder and open it. Now you are ready to play the game according to the method given below. In Super Dodge Ball game, you have to defeat your opponents with the help of a ball into a court. At both ends, there is a team of three players. You have to get out each player of your opposite team from the court. After getting out, your player will also help you and hit the ball from the back side of opponent team. You can power up your player with the help of A+S buttons. D button will use to jump, S button is used to pass ball to your fellow. If you succeed to pull out of your all opponents, you will win the game. There are 7 teams in this game and you can select any.